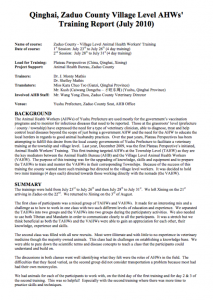 Veterinary trainings were given to animal health workers in Zaduo county in December 2009 and July 2010. At grassroots level, many leaders have expressed the need for veterinary clinicians to be able to diagnose, treat and help control local diseases, beyond the scope of the skills of government Animal Health Workers (AHW). There also is need for AHWs to be able to inform and educate local herders about good animal husbandry practices. The first training targeted AHWs at the district level, as they are the key mediators between the Animal Health Bureau and village level AHWs. The purpose was to upgrade knowledge, skills and equipment. The training was then followed by two additional short courses directed towards village-level specialists. All the participants were provided with a veterinary box full of medicines and equipment, giving continuity to the training as they return to their villages/nomad camps to perform their work and to strengthen their skills and knowledge. Much was learned in each training and the county Animal Health Bureau was pleased with what was accomplished.